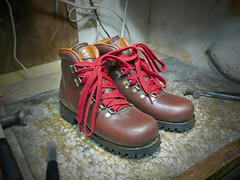 I have to say, the red laces on these custom hiking boots are classic! My dad is an everyday hiker, and my mom never lets him leave the house without boots much like these. She also bought him a boot dryer...I think she's trying to tell him something.